Tonight I'm drinking Heresy brewed by Weyerbacher Brewing Company in Easton, Pennsylvania. 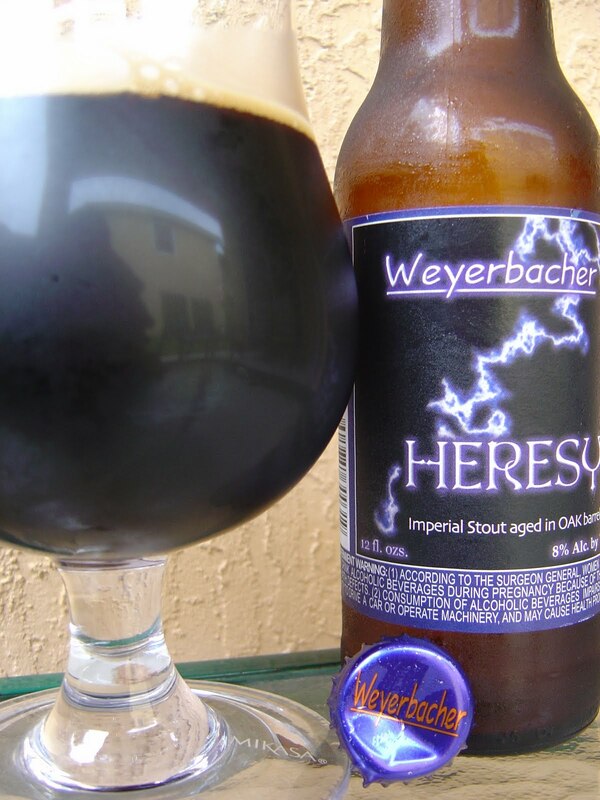 Heresy is an oak-aged version of Weyerbacher's Old Heathen Imperial Stout in which the oak barrels were used to make Kentucky bourbon in a prior life. The label is simple yet stands out with what appears to be a giant flash of lightning on top of a black background. I brought this one from Pittsburgh because though we get some of this brewery's beers here in Florida, this isn't one of them. Rich chocolate aroma, with molasses and brown sugar backing that up, slightly sweet. The flavors start out very similarly with a creamy rich chocolate beginning. Definitely some initial wood characteristics, too. Licorice and dark cherry are also noticeable flavors throughout this beer. Though the beer starts out slightly sweet, some bitter coffee flavors keep this beer perfectly balanced, right in the middle. The bourbon barrels are definitely providing a touch of spirits flavoring to this beer, and the 8% alcohol offers a little alcohol burn and kick. Smoke stands out toward the end, too. A little low carbonation-wise, nice medium-plus body, and complex, complimentary flavors. And the bonus is that the bourbon barrels add some interesting flavors, while not being the normal dicks they are to many other beers! I've tried this beer twice. It's not for me. Too much going on. 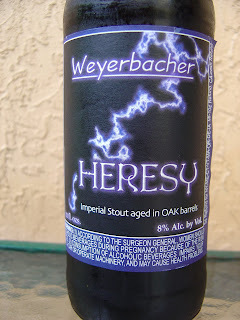 I've found that a lot with Weyerbacher...almost like they are trying too hard. Normally, I hate all the oak this, bourbon barrel that. And although I see what you mean about a lot going on with this one, I thought it was a pretty good beer. Good flavors, balance and no annoying bourbon. If I want JD, I know where to buy it.